Park the car and forget about it while you’re in Québec. This city is meant to be explored on foot. Québec (Iroquois for where the river narrows) was founded in 1608 when French explorer Samuel de Champlain made it the administrative seat of the colony known as New France. The streets are packed with heritage and history and a walking tour is the best approach for learning about the city. Our guide, Michel, was a font of information and imparted fascinating facts about this “Gibraltar of the Americas.” Pack your comfy shoes, an umbrella and take off on an amazing informative session well-worth the price of admission. The food in Québec is out-of-this-world. 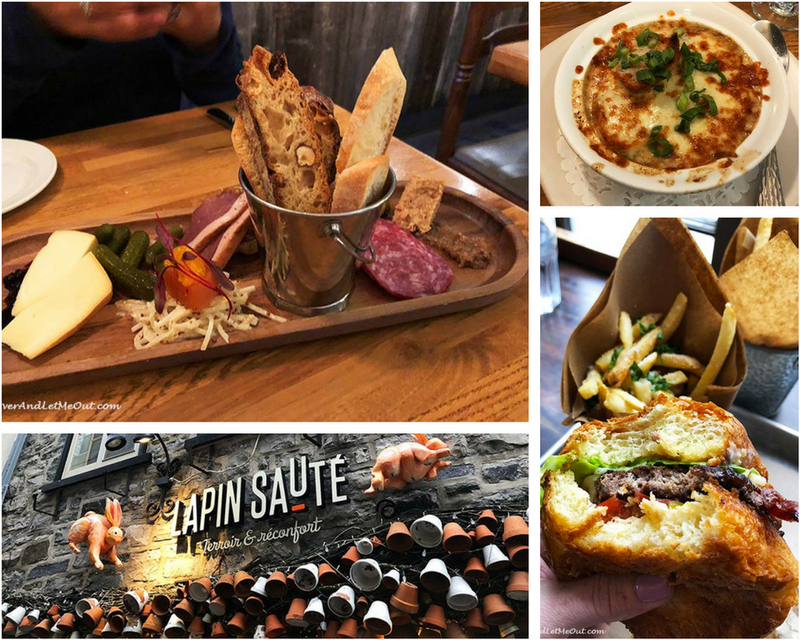 Therefore, a food tour is ideal for experiencing the flavorful side of Québec. Whether it’s an organized tour or restaurant-hopping on your own, you’ll quickly learn the gastronomic treats are deeply rooted in the city’s heritage and culture. Our guide, Jocelyn explained the fundamentals of the native people’s diet were squash, corn, and beets. Furthermore, she detailed how honey, rabbit, cheese, and duck became predominant in the Québecois diet. And naturally, we tasted a variety of foods. Savoring Québec favorites such as crêpes, fritters, and chicken paté was magnifique! Oh, and the smoked salmon from New Brunswick served at a local spot called, La Buche, was my absolute favorite of the trip! 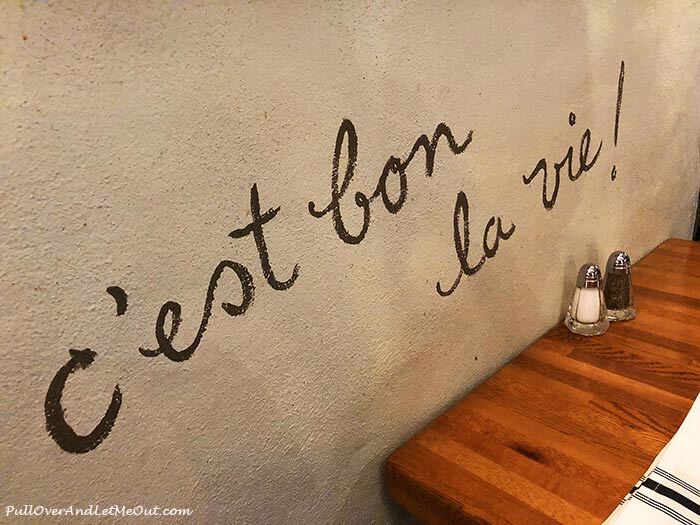 Boire is French for the verb, drink! 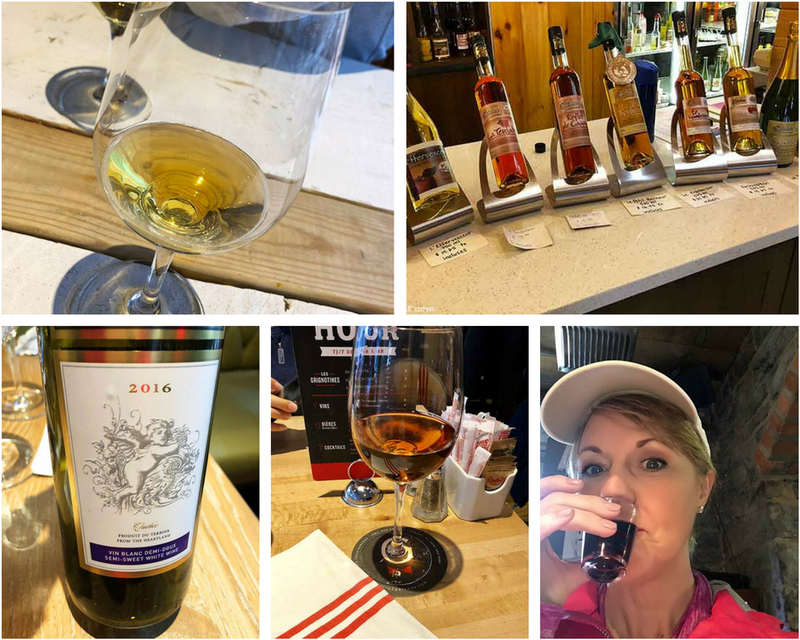 Cider, Normandy-style wines, black currant wine, iced wine and a shot called Caribou – red wine, whiskey, and maple syrup; drink in the local beverages. The climate is a major factor in the types of wines produced and the grapes which will survive in this region so sampling new tastes is a joy. There are also craft brews and other libations exclusive to the region. It’s fun to responsibly sip and experience unique flavors while getting an education. 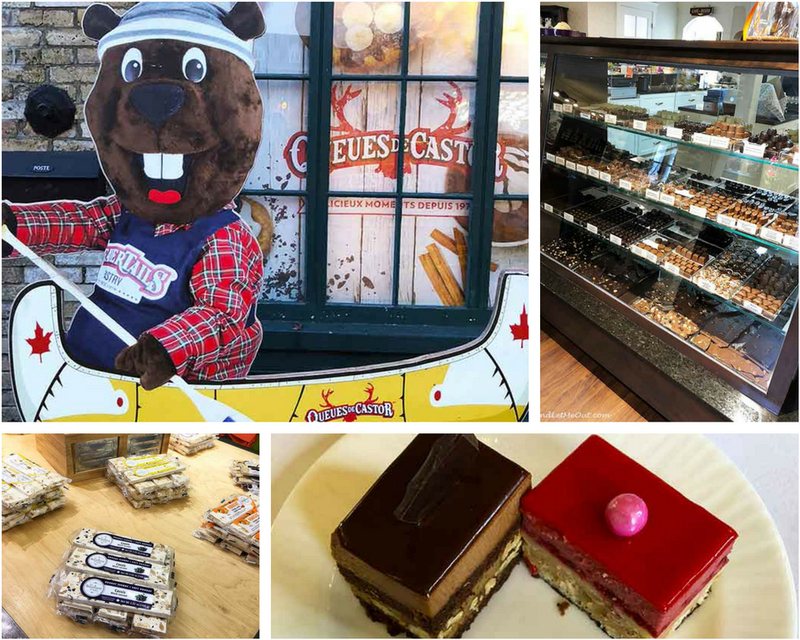 Delicious cakes, croissants, and a delicate smooth candy whose origins date back to antiquity called nougat are only of few of the delicious après diné treats Québec serves its guests. Be sure to leave room for sampling the chocolates, ice cream and something truly Canadian, a beaver tail. You’ll be doing so much walking, dessert is guilt-free if not calorie-free. Maple is a staple. 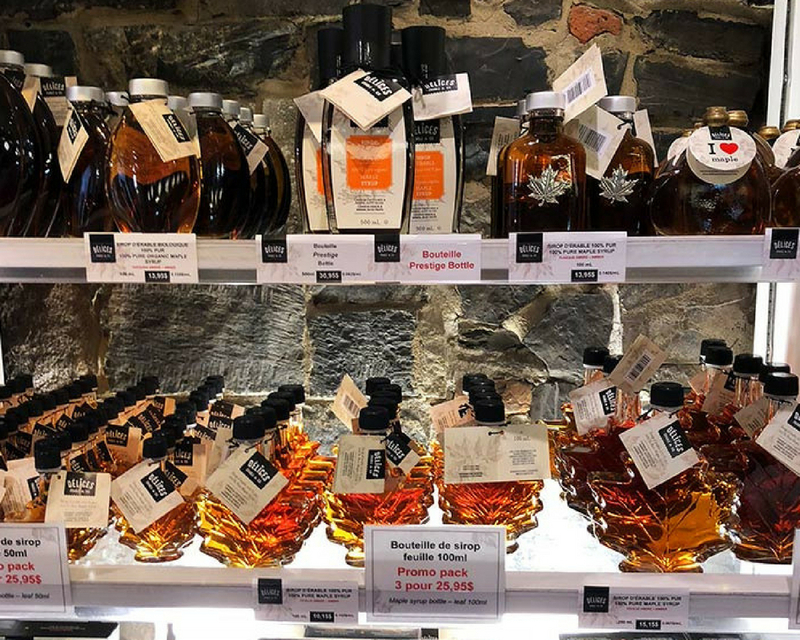 An astounding 72% of the world’s maple syrup is produced in Québec. Hence, a visit to Québec isn’t complete without trying this sweet, sticky favorite. In Québec, you’ll taste a bit of maple in virtually all you eat. Maple candy, maple syrup, maple ice cream, maple coffee, maple tea, maple fudge; they’ve even got maple in powder form so it can be sprinkled on top of food! Basilica-Cathedral Notre-Dame de Québec and the Ursuline Chapel are two examples of Québec’s beautiful religious architecture. Québec is filled with magnificent churches. The city holds a strong Catholic legacy which includes the arrival of the Jesuits and Ursulines. When the English arrived they brought Protestantism and as a result, this city is renown for its splendid churches, basilicas, and houses of worship in a variety of architectural styles. 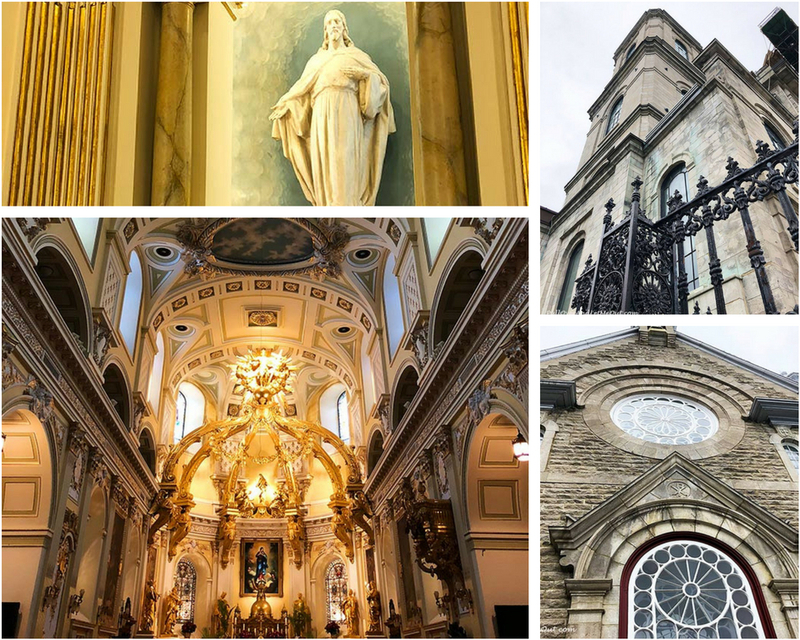 The religious history of Quebec is a significant part of its character. 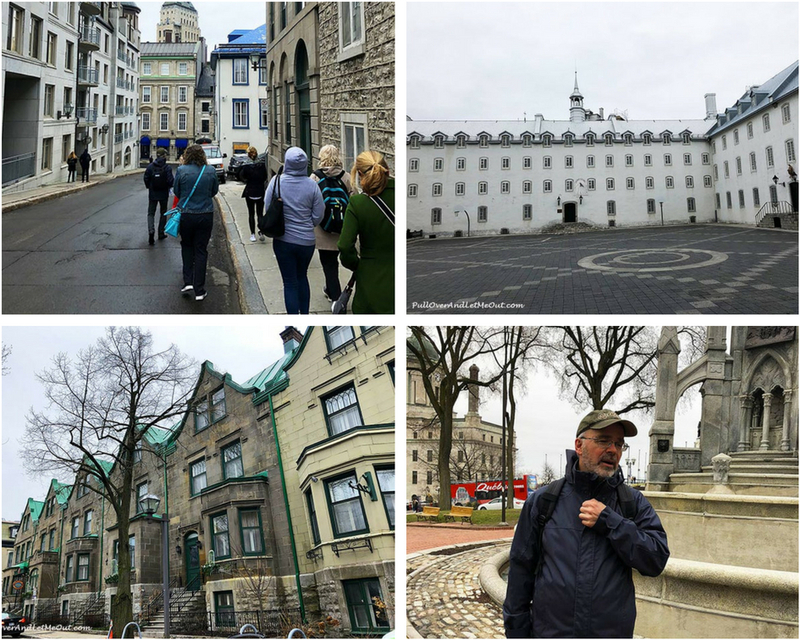 Exploring these edifices is vital to understanding the story of Québec. 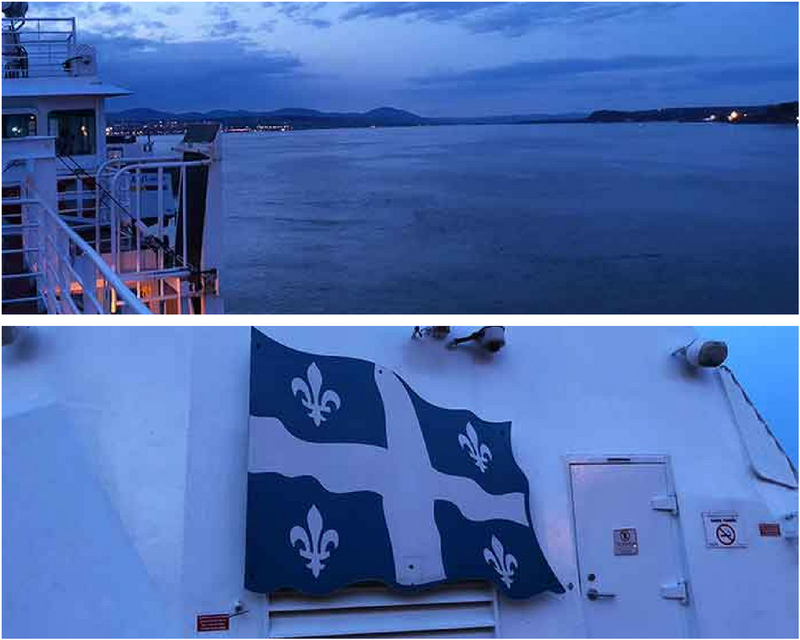 It’s known as The Cradle of French Civilization in North America and The Garden of Quebec. L’Île D’Orléans is just across the bridge from the city in the St. Lawrence River. 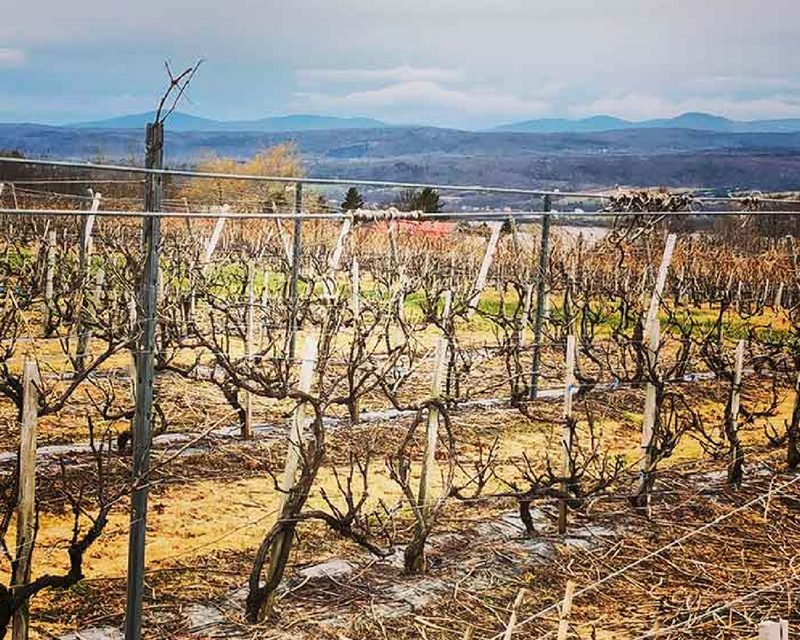 This beautiful rural area features vineyards, farms, wineries, quaint homes, and pastoral scenery. The island is also steeped in history as L’Île D’Orléans is the first settlement in the St. Lawrence River. 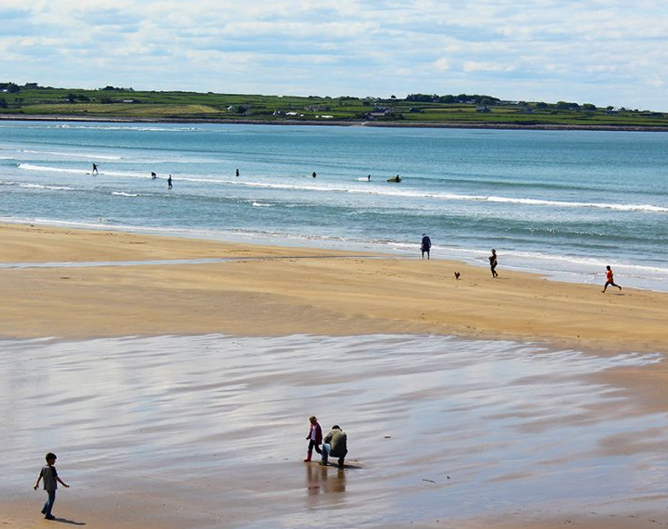 A short ride from the city, there are bus tours available for enjoying the beauty of this delightful island. It’s a fun way to spend an afternoon and the view is spectacular. This is the iconic landmark on the travel brochures and is the focal point of the city. 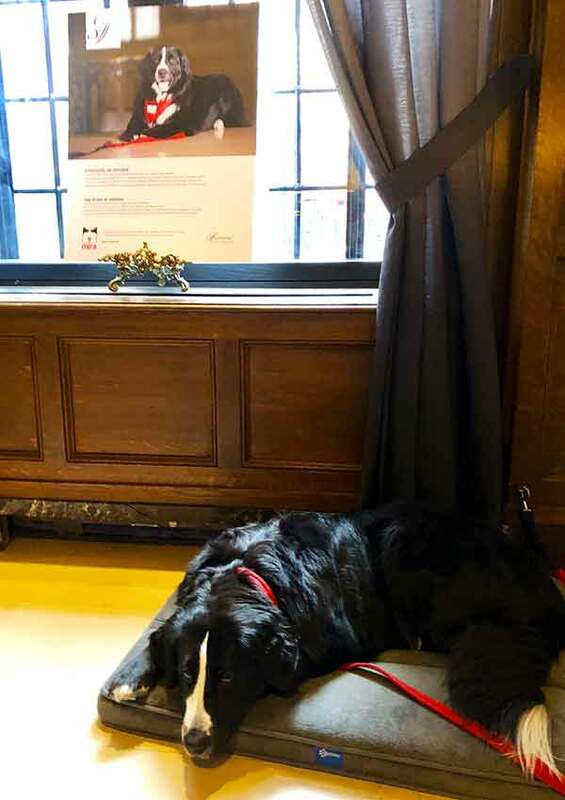 Located within the walls of Old Québec City the historic Fairmont Le Château Frontenac Hotel features 611 elegant and enchanting rooms, a stunning lobby, chic boutiques, fine dining, and a canine resident in the lobby named Daphne. It’s definitely one of the most memorable and luxurious hotel stays of my lifetime. It was built in 1893, is perched high on a cliff, and looks like a chateau – as intended. Even if a stay here isn’t in the travel budget, you’ll want to check out this exemplary hotel. What is Poutine? It’s a purely Canadian dish created in Québec in the late 1950’s. 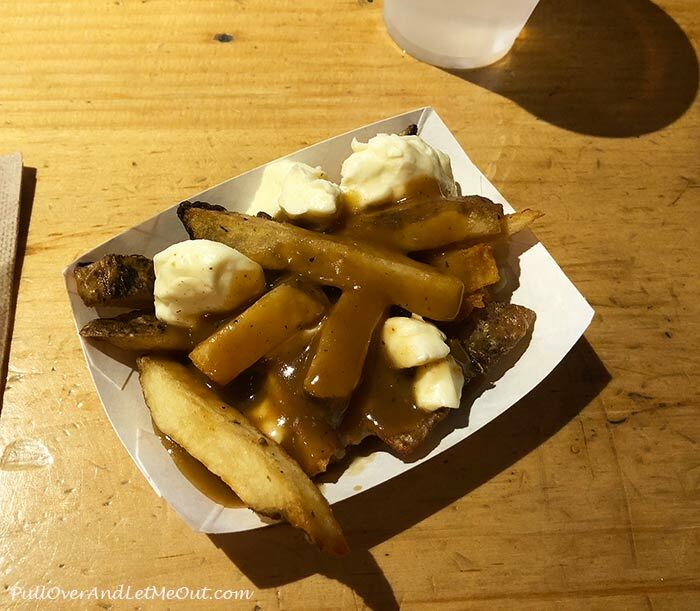 It’s made of French fries, gravy and cheese curds but each restaurant tends to have its own unique twist. Poutine is gaining notoriety outside Québec and is a celebrated cultural symbol. The better the squeak the better the curd! 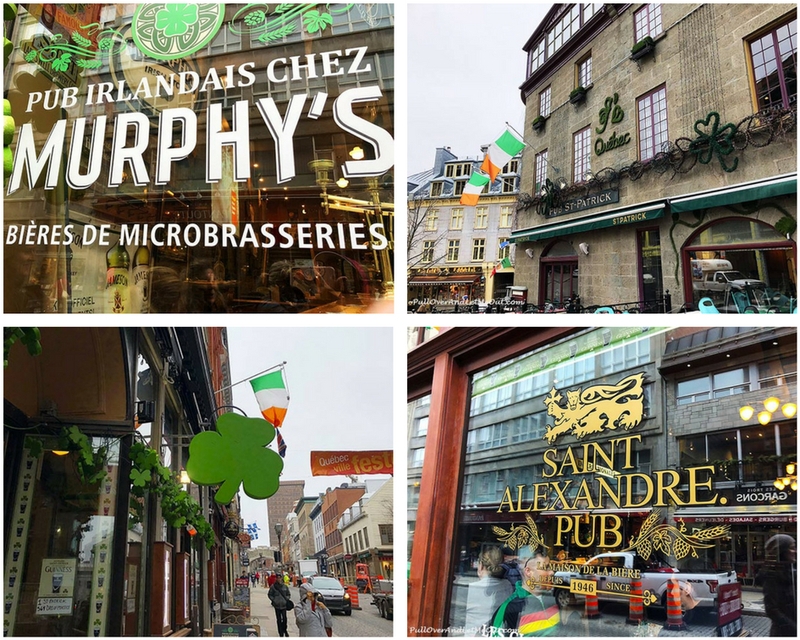 It was surprising finding so many Irish pubs in Québec and a little odd hearing “Whiskey in the Jar” being piped onto the street in this French-speaking city. Nonetheless there’s an Irish influence in Québec. Nothing highlights that influence more superbly than the quintessential Irish pub. Pop in, have a pint, and say, Sláinte! 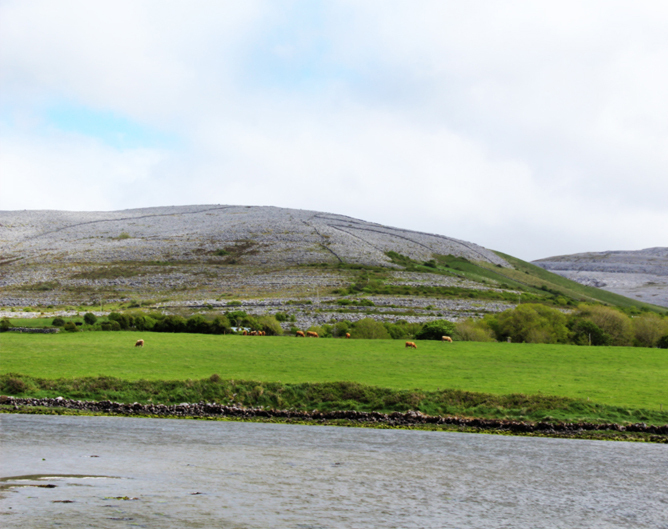 There are so many statues dotting the landscape I lost count. Take some time when you’re exploring the city to read up about the people represented and their contribution to life in Québec. 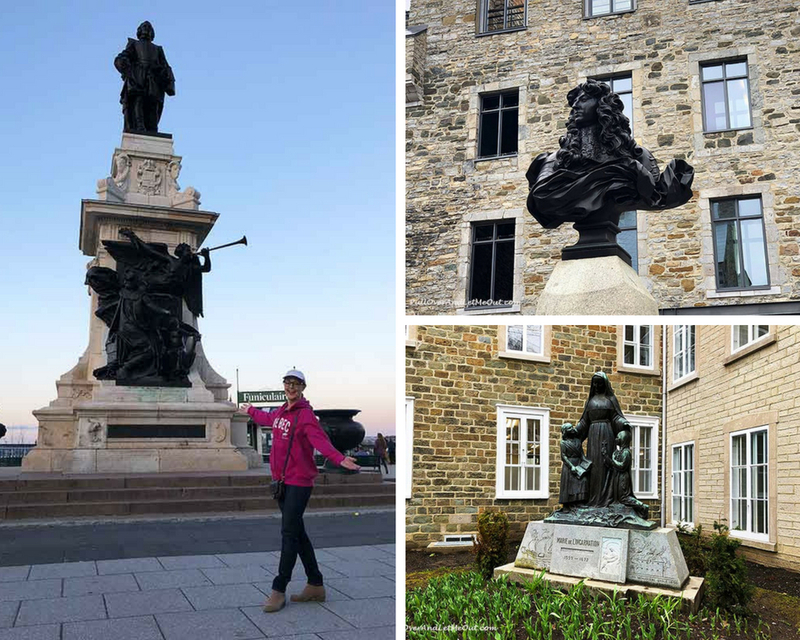 You’ll find a statue, plaque or monument on virtually every street corner and its a lovely tribute to the people who shaped Québec’s history. It only costs $7.20 round-trip and you’ll get such a captivating view of Old Québec City, it’s worth every penny. The complete trip takes about 45-minutes if you return immediately or if you’ve got time, spend an hour or two on Lévis. 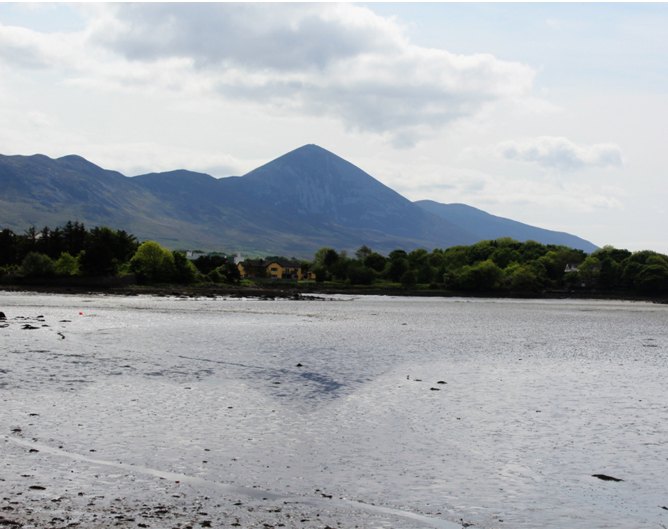 There are a craft brewery and a couple of restaurants close to the ferry docking point. 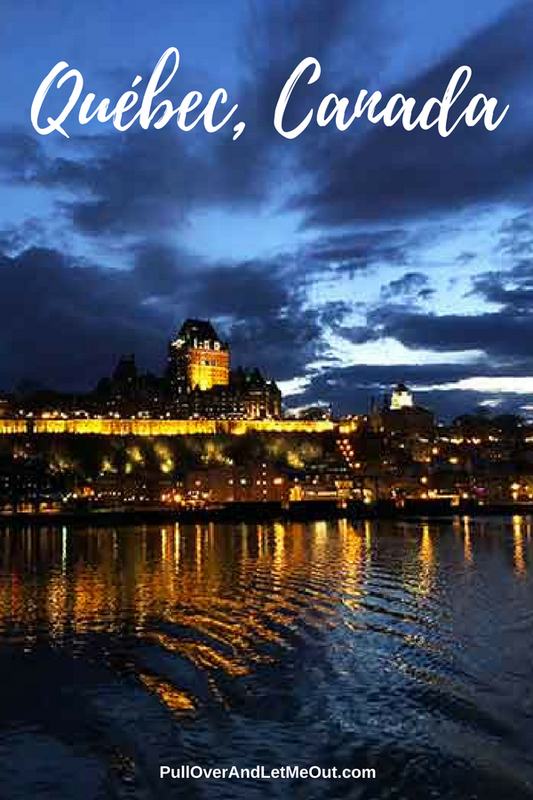 The view of the Citadel, city walls and Fairmont Le Château Frontenac Hotel is breathtaking. It’s a winning photo-op too. First and foremost, watch your step! It’s most practical to walk in Quebec, be that as it may, many of the streets are cobblestone or uneven. Additionally, there’s a significant amount of construction taking place. Moreover, dodging scaffolding or closed sections of sidewalk can be risky so beware. If you’re not up for walking or mobility is an issue, there are multiple bus tours to choose from. Québec, the oldest fortified city north of Mexico, is perched on a cliff. If you make your way down to the wharf and lower city, you’ll have to climb back up. It’s a workout! There’s the Funiculaire, which costs $3 per person if you prefer not to climb but if you’re up for the exercise, go for it! When making dining plans, you’ll want to make reservations. The seating areas in many restaurants are small but the authentic cuisine is memorable. If you don’t mind a slight wait, it’s possible to just show up. 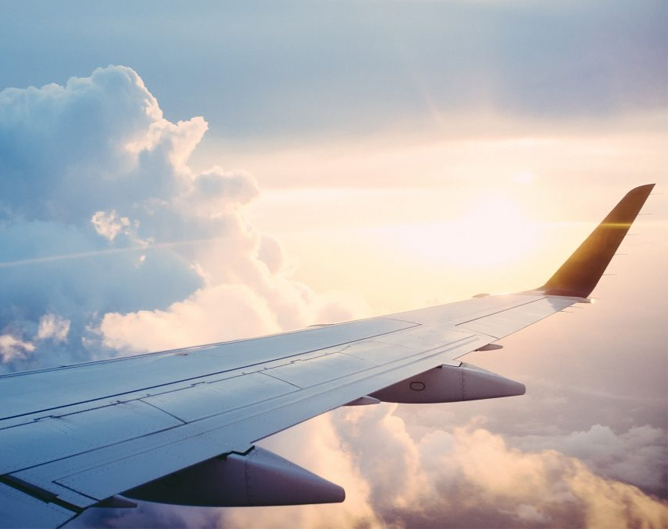 Summer is the busiest time of year, but the winter carnival is a huge draw as well so you may wish to schedule your travel plans accordingly. As for ground transportation, I found Uber perfect for making my way to the airport which is about 20-minutes outside of the Old City. Once in the walls of the city, walking really is the easiest way to get around. Québec is a French-speaking city. You’ll feel as if you’re in France at times. However, nearly everyone speaks English as well. Don’t be intimidated if you aren’t fluent in French. 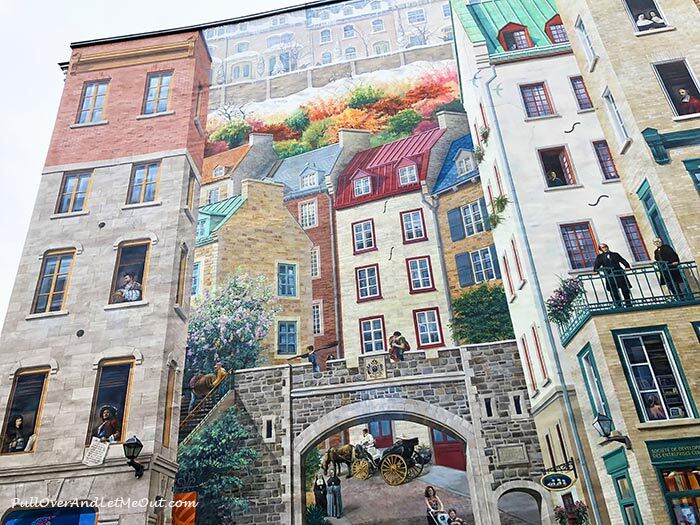 La Fresque des Québécois located in the lower part of the city. 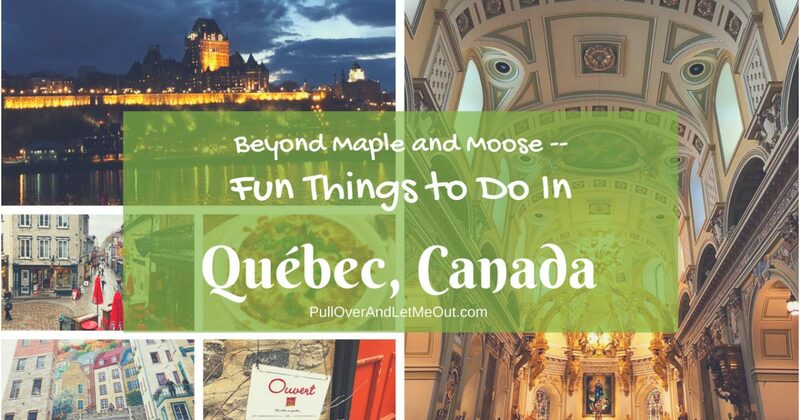 There are so many fun things to do in Québec, Canada it’s impossible to list them all. 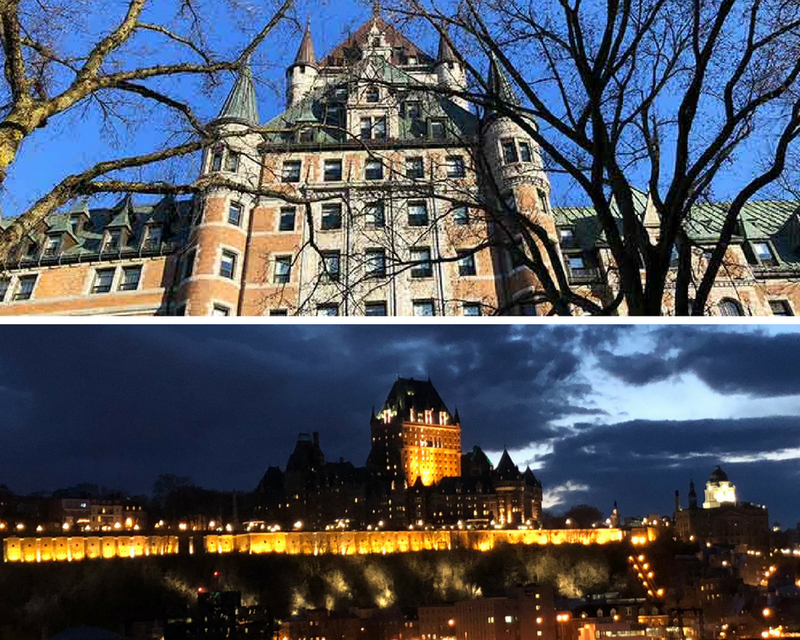 Whatever’s on the itinerary, you’ll find Québec is a unique fascinating city and its people incredibly friendly. This alluring European-style city in North America welcomes its guests warmly. In Québec, c’est bon la vie! Tell me about your travels to Québec in the comments below! Fees for the tours I took were included in the conference registration fee. All opinions are honest and my own. That dog in the hotel is adorable. It looks like a wonderful place to visit! Such a great round up of great things to do in Quebec! You’ve got me wanting to return and explore more and eat more!! !